We all know what it’s like to get home after a really long day – you’re trying to do the dinner, get the bath on, feed the cat (or even just find the cat). Sometimes the last thing you want to do is curl up and read, especially if it’s a book you’ve read a thousand times before. But as we all know, the benefits of growing up in a house full of stories are immeasurable. So here are some of my top tips to make reading with your little beloveds a special time for everyone. Your voice is the magic, the special ingredient that turns a book into a cherished story. You don’t have to do any funny voices or quirky accents – you can leave that to Tom Hardy on the bedtime hour. Of course, if you want to do lots of different clever or silly voices, you absolutely can. It can be so much fun, but be warned – you might have to do that same voice every time you read that book for the next three years! I’m so happy to read rhyming stories or illustrated poetry on the train, or in a café, or on the beach in the middle of the day, but not last thing at night. Something about the rhyminess would send me slightly over the edge. Remember, there are thousands of wonderful books just waiting to be discovered. You don’t have to suffer reading a book that’s driving you crazy – unless it’s your child’s favourite! Then I can’t help you… just try and switch it up whenever you can. If you’re desperate for a change of bedtime book or tight for space on your bookshelf, a great way of including regular new books is to join a library and let your little one chose their own books. This also encourages a life-lasting love of literature through supporting libraries, an absolute godsend to any parent. I found it really helpful to use our bedtime story as a punctuation mark for the end of the day. So, I would do the bath, the tea, and all the rest of the bedtime routine before we climbed into bed to read a story. That way it’s easier to relax as an adult, because you’re not focused on getting to the next thing; it is part of your day and your child knows this cosy time is especially for them. This is particularly useful if you travel a lot, or if you go to visit friends. Wherever you are, the day can still end with a gorgeous story. It doesn’t matter how many books you’re reading a night, or how long they are. What matters is that you’re reading. By keeping story time regular it happens naturally. Sharing a book every night is where the enchantment happens. Whatever interests your child, there is a book out there just for them. Some books are loud, some books are soft and floaty, some books are educational or emotional and might be a gentle talking point. Some books are laugh-out-loud funny and some books are repetitive and safe. I found it useful to have some firm favourites we could rely on so that when we did read a book that lead to discussion there was something familiar and well-loved we could return to and end the day on. Minnow is different from the other girls in her town. There’s plenty to set her apart: the blossom of pale scars which lie beneath her delicate ears, her affinity with the water which leaves people speechless, and the time when, in deep, deep water, her body began to glow like a sunken star. She has grown up on a boat, raised on stories and songs about a strange, enchanted ocean called The Wild Deep. Now with her mother missing, and questions to be answered, Minnow must make the dangerous journey to a hidden world, where fairytales become reality. Can a girl who is lost on land find answers in the Wild Deep? 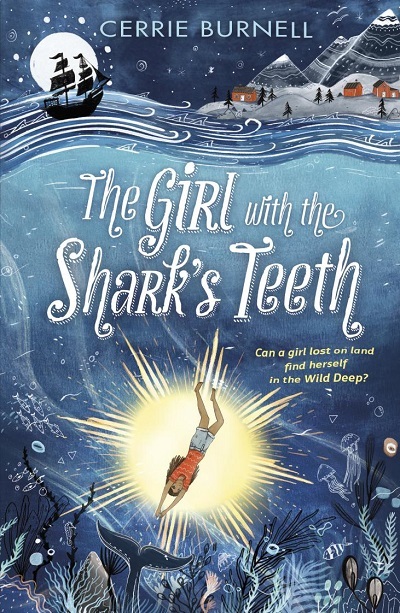 Watch Cerrie read an extract from The Girl with the Shark’s Teeth below. Cerrie Burnell is an actor and writer best known for her work on CBeebies, a role that has earned her critical acclaim and a devoted fan base. In 2011 Cerrie was named in the Observer’s top ten children’s presenters and the Guardian’s 100 most inspirational women. She has been an author in residence for Great Ormond Street and is a patron of Polka Theatre for children.